A barbecue and auction held at Porloe Farm, Mylor Churchtown, raised £900 towards the restoration of the village hall, with £3,000 being raised overall. The aim was to raise money for the Tremaune Hall, which is at the centre of the village of Mylor Bridge, and to encourage interest in this major restoration project. The management committee has worked hard for many years to generate funds through grants and events. Numerous organisations in the village have also participated in fund-raising activities, in order to help create a valuable community centre to be enjoyed by everyone. After a wet start to the day, the sun finally shone and over 100 people (adults and children) spent a lovely evening in the beautiful setting over-looking Mylor Creek. 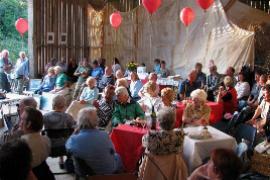 With plenty to eat and drink, everyone was easily accommodated, some inside a large barn and others, thankfully, able to sit outside in the warm evening sun. Local antiques expert, Leon Robertson, conducted a lively and entertaining auction, raising the £900 from just 36 objects. A wide variety of items had been donated including pictures, china, silver, a large hamper of food, an exercise bike and first edition books by local children's writer, Angie Sage. One of the more unusual results was the staggering sum of £15 paid for two "vintage" bottles of Guiness! Many supporters who were unable to come sent generous donations, so with ticket sales and auction proceeds, an amazing figure of £3,000 was reached. Following some large grants and local fund-raising, work on phase A of the restoration project will begin soon. This will concentrate mainly on the old hall with its traditional stage and barrel ceiling, which is a grade 2 listed building. Fund-raising continues towards phase B.